How much money should I spend on Internet Marketing? Website Design, Search Engine Marketing, SEO, online advertising and more. We are often asked what is the right amount to spend on Internet Marketing. Also known as digital marketing. Through the years, we have taken the time to do research on what is the proper investment, what you can expect and what are the benefits. Most of all, how much money can you get back if you are investing in marketing online. The most important thing for any small business is to realize that its not to expensive. It is absolutely necessary. If you survive on references and cold calls then you are surviving, not thriving. Below is some great information to follow. Our resources are (existing clients, Gartner, Marketing Sherpa and google) the following applies to your business and is a good average for most business models. 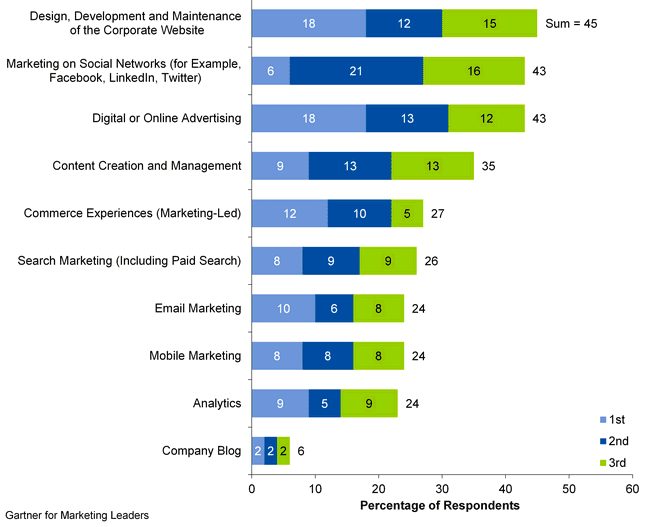 Digital marketing averages a 5-7x revenue return over traditional marketing. The average ROI for digital spend is 6-8% but can be higher. This means if you spend $2,500 a month on $1M revenue you should see growth of $5,833 a month in revenue. Digital marketing spend is as follows. We will be doing all of these but less on social media because of your industry. We wouldnt recommend spending more than 10% of your gross revenue on digital marketing but 2-5% is the right mix for most small bsuiness budgets. If you spend 2.5% ($25,000) you should obtain 6% sales growth ($60,000) on a $1M business. Its necessary to watch the spend as the more you spend, doesnt mean that you will get more than 6% growth. Also, you will spend less with digital marketing with better returns than traditional marketing venues while improving customer satisfaction and loyalty through market awareness.